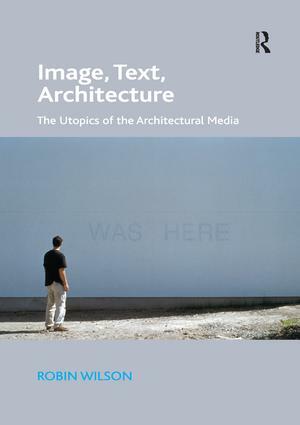 Image, Text, Architecture brings a radical and detailed analysis of the modern and contemporary architectural media, addressing issues of architectural criticism, architectural photography and the role of journal editors. It covers examples as diverse as an article by British artist Paul Nash in The Architectural Review, 1940, an early project by French architects Lacaton & Vassal published in the journal 2G, 2001, and recent photography by Hisao Suzuki for the Spanish journal El Croquis. At the intersection of image and text the book also reveals the role of the utopian impulse within the architectural media, drawing on theories of utopian discourse from the work of the French semiotician and art theorist Louis Marin, and the American Marxist critic Fredric Jameson. Through this it builds a fresh theoretical approach to journal studies, revealing a hitherto unexplored dimension of "latent" or "unconscious" discourse within the media portrait of architecture. The purpose of this enquiry is to highlight moments where a different type of critical voice emerges on the architectural journal page, indicating the possibility of a more progressive engagement with the media as a platform for critical and speculative thinking about architecture, and to rethink the journals’ role within architectural history. Robin Wilson works at the intersection of architecture and art through the writing of criticism and theory, curatorship and collaborative practice. He teaches history and theory of architecture at the Bartlett School of Architecture, University College London.